Three Gamer Soda flavors down… one to go! Since this particular Gamer Soda doesn’t have a flavor listed on it, yet the packaging is purple, I’m going to go out on a limb and guess that it’s grape. I am the connoisseur of grape flavored sodas between the two of us, and I look forward to trying this installment from Gamer. You can read all about my history with grape sodas in some of the many links I’m posting in this article. Enough chit chat… time for business! This has a cheap grocery store brand grape soda smell. Now if you’ve read those articles I told you about, then you’d know that sentence is a compliment. For those of you who are too lazy to read the articles, that first sentence means that it has a strong, recognizable, definite, grape odor. Gamer Soda surprises me most every time when it comes to the punch of the aroma that escapes the bottle, shame on me for doubting. Let’s find out if the flavor matches. The first thing I noticed is that my stomach is VERY empty. I really need to eat something after I finish this review. Secondly I’m really impressed with the amount of flavor I’m getting here. It has that “artificial grape” taste (again, read the articles…), but with a very clean finish. 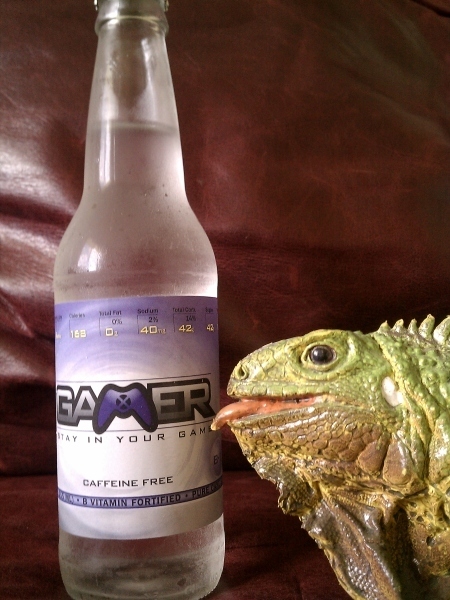 Gamer Soda Grape seems to have the best of both worlds, excluding the sodium benzoate of course. You get just the right amount of grape flavoring without all of the heaviness a non-brand grape soda would carry with it. If I do say so myself, Gamer Soda Grape is the first refreshing grape soda I’ve ever had. There’s really not much more to say. I don’t even have a funny story to go with this, so here’s an amusing word… Wolpertinger.